First, a few words about the author, Mr. Patrick Walsh. Few, if any, can match the first-hand experience of Mr. Walsh on so many fronts battling the Communist conspiracy. His wide experience as a trade union organizer, soldier, undercover agent for the RCMP, lecturer, writer, and researcher on Communism, Marxism, and related subjects, has made him one of the free world’s leading authorities in his field and extremely well qualified to write this little work on Red infiltration and subversion in Ottawa. In 1953, after his service with the RCMP, Mr. Walsh was a voluntary witness before the USA House Un-American Activities Committee, and received its thanks for the valuable evidence he presented, particularly on the top Communist agent, Alger Hiss. Patrick Walsh is now an Executive Board Member of the World Anti-Communist League, and research director of the Canadian League of Rights. Mr. Walsh, in this booklet, does not pretend to deal with more than a few highlights of a long catalogue of Communist infiltration and subversion within the Federal Government. He goes right back to the recruitment of Oscar D. Skelton by Comrade Louis Kon in 1923, and shows how Skelton — the ‘father’ of External Affairs — used his key position to recruit young Marxists and ‘colonize’ the Federal civil service in general, and External Affairs in particular, with Marxists and Red ‘sleepers’ who could be activated in the future. Security shatters, not because there are no more locks, but because the men naturally trusted with the keys and combinations are themselves the conspirators. It should be noted — indeed, emphasized — that while Mr. Walsh exposes a number of individuals within the public service who turned out to be Red agents and subversives, this in no way reflects upon the character and integrity of the tens of thousands of loyal and dedicated men and women working in the Federal civil service. We must always remember that the betrayer is the exception, not the rule; and we should thank God for that great majority of public servants whose only loyalty and commitment are to our country and our people. 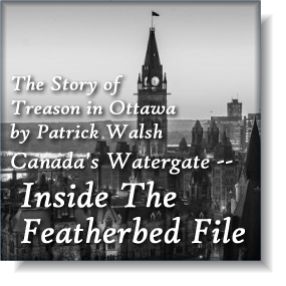 As publisher of The Canadian Intelligence Service and other reports for over thirty years, most of the facts presented by Mr. Walsh are familiar to me. But the marshalling of this material in chronological order and its concise presentation in booklet form, should make much easier the introduction of these essential facts and documentation to others. Therefore, in writing this little work, Mr. Walsh has rendered a significant service to the cause of freedom in Canada. And because he is one of this country’s true patriots, this service in itself will be his reward. The almost incredible story of Soviet penetration into the Canadian civil service has never been written, with the exception of the Gouzenko exposé of the ’40s which uncovered one branch of Soviet spying: the GRU military intelligence network masterminded by Col. Zabotin. However, the Royal Commission Report dealing with Soviet espionage in the ’40s revealed that other Soviet spies active in the External Affairs Department had either fled the country (Jean-Louis Gagnon fled to Brazil, with the cooperation of Mitchell Sharp, then a director of Brazilian Traction Corporation) or could not be positively identified because only their code names were known. The Communist International, besides issuing general guidelines, expressed its views on specific Canadian problems through the Anglo-American Secretariat, one of the organizational subdivisions of the Comintern. It was composed largely of American and British Communists working in Moscow, who followed events in Canada, read the minutes of leading CPC bodies and reports submitted by Canadian Communists on various topics. Periodically, Comintern officials discussed the affairs and problems of the Canadian Communist movement with delegates from the CPC. On the basis of these discussions and analyses, statements and advice in the form of directives, resolutions, telegrams, “Open Letters” and articles in the Comintern press reached the CPC. Material that could not be entrusted to the mails was sometimes delivered by the special courier service of the Comintern either directly from Europe or via the Communist Party of the U.S.A. Occasionally, in the years 1924-1927, the Comintern would use the facilities of the Soviet Trade Mission in Montreal.